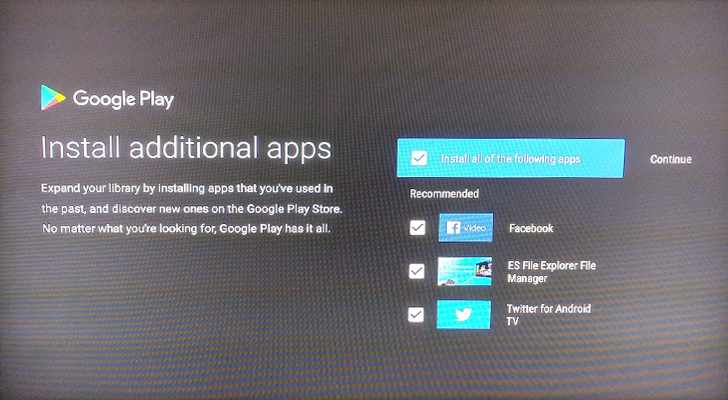 When you're setting up your Android TV device for the first time, or after a wipe, Google will now show you a few apps you can install. The recommendations are based on your installation history, so if you use Twitter on your phone, you might see the TV application show up as an option. If you don't care for any of the recommended applications, you can uncheck the box and select Continue to finish setting up the TV/set-top box. Pretty simple.